Trying to keep Trout in home aquarium tanks may not be the best idea but it is still possible as long as you follow some simple rules. But before we move on to start your mini project, let us first try to understand their behavior and general requirements. Trout being a freshwater fish that lives in cold temperate region is among one of the few species that can still be found living in the wild. Being an active fish which loves to swim in fast-moving waters, they are often targeted by anglers and the thrill and excitement of actually catching one remains the main point of attraction. The number of trout these days has been dwindling and some species are faced with the threat of extinction. So far attempts to breed them in commercial fish farms have been successful and somehow there are instances whereby there are also people who would rather have them kept in fish tanks and raise them as pets. 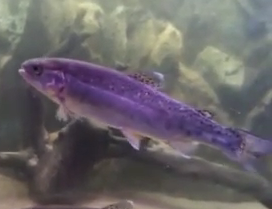 Though this may sounds odd, for me there is nothing wrong with it as you can actually view and watch them as they swim around in the aquarium or maybe the idea is to preserve some of the exotic trout species. Compared to raising them in farms with large ponds, confining them in home aquariums provides the real challenge because you have to deal with space constraint and more important is on how to simulate the natural living conditions. In order to ensure that the fish thrives, they need ample living space to match with their full grown size that can reach anywhere between 20 to 30 inches. However, since they are kept in smaller aquariums, there’s high probability that your pets may not achieve its full potential with the length normally seen for aquarium-bred trout usually averages about 12 to 15 inches. The best aquarium capacity one should consider is a tank with minimum at least 200 gallons (nothing below) with the ideal capacity measuring above 1000 gallons. With that in mind, even with the largest tank you can afford, this can only house maximum about 2 to 3 of the fish. Avoid cramping them in tight spots because you will be subjecting them to harsh living conditions that can result with the water getting dirty quickly and stunting their growth. Apart from the space issue, trout also need highly oxygenated and fast moving water so that can swim against the current. As they navigate around, this will allow their gills to take in the much needed oxygen so that this can complement their active swimming activity. Without this, your trout will basically end up listless and will become prone to disease. Apart from that, as they constantly move about, this can help them to develop their muscles and trout fish are known to be one of the fastest growing species. That is why your tank needs powerheads to create the flow and if possible attach it to a venturi system so that this can further enrich the water with oxygen (you might be interested to read up on managing TDO levels). All these are critical areas that you will need to look into and provide for your pets. If you are unsure as to which type of powerhead or model to get, the best way is to head over to the pet shop and look for a unit similar to the one that hobbyist use to create natural flow current in saltwater reef tank. As mentioned earlier, they are classified as a member of the cold water species. Thus your home aquarium needs a chiller so that you can lower down the water temperature to at least 15degC. If possible, combine a cooling system with a regulator unit so that you can control the exact water temperature that you want in the tank. Having said that, this means that overall this will incur high operating cost especially the electricity bills just to maintain the trout tank, something that you will need to keep in mind. In order to ensure that the water stays clean all the time, try to avoid overfeeding and if possible introduce small but frequent number of meals so that your fish have enough time to finish all the foods. Use of aquarium filter is a must and those preferred setups are usually using those high capacity models like the Fluval FX5 or Eheim Series with 2 or 3 units combined together complete with a sump system. Consult the manufacturer if you are unsure whether you are providing enough filtration capacity meeting your aquarium size. Trout is basically a carnivorous species and their favorite foods include insects, worms, shrimps and other smaller fish. Basically the best diet you can provide for your pets is to feed them with variety and different combination of food so that they get all the nutrition that they need. In order to avoid introducing disease to the tank, try to source for your live fish food supply from reputable dealers that maintain high standard of hygiene. You can also play your part to provide the next level of assurance by quarantine and keeping the worms and shrimp in another separate tank and frequently changing the water before feeding it to your trout. This will ensure that at least you will know that your foods are safe since you are providing an ample time to flush out the germs and monitor if the disease is still there. There are reports of hobbyist substituting live foods using only hikari carnivorous pellets but I wouldn’t recommend feeding on it for long term. If well cared for, it is not surprising to find the trout adding at least one inch in length every month.